Essex is the location of the fourth main area for PASK, PASKE, and PASQUE families. The earliest progenitor in Essex is John PASK. John was born in 1771 in Thundersley, Essex. He married Frances HAFFINDEN. More information is available in the narratives section. The icon indicates John and his wife Frances HAFFINDEN's descendants, including the well researched James PASK who immigrated to New Zealand. Thomas PASKE, and his son George PASKE (1682 - 1753), were vicars of Finchingfield. They are descendants of John PASKE who lived at Stragwell, Suffolk. The icon indicates descendants of John PASKE. Sincere thanks to co-researchers for contacting us and sharing their research, in particular Graeme Adams, Dianne Baird, and Eardley Bryan. You can find co-researchers listed in the citations for the individual narratives. 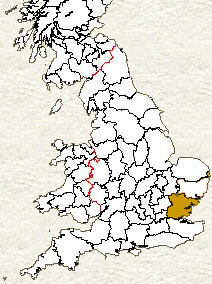 Further details on Essex and these registration districts are available on Genuki.